Yoshi’s New Island lacks the ‘wow’ factor of earlier games. IT IS amazing how Nintendo continues to breathe life into characters, many who are older than the people actually playing their games. Take Yoshi, for example. The little lovable reptile debuted in 1990 on the Super Nintendo console as part of the game Super Mario World. gameplay, according to many pundits, myself included. It seems ironic that as a new Donkey Kong game is released, we also have a new Yoshi game on our doorstep. Is "New Island" better than the original Yoshi adventure or the new Donkey Kong game reviewed recently? Sadly the answer is negative. That is not to say that Yoshi's New Island is a bad game. It is actually a wonderfully colourful and enjoyable adventure. Also, all of the popular play elements from the original Yoshi game are to be found in the new release. Yoshi still has to carry baby Mario through the stages, plus he can swallow enemies and fire them back at other foes as missiles. This neat trick revolutionised the series when it was introduced nearly 20 years ago and it is still fun today. 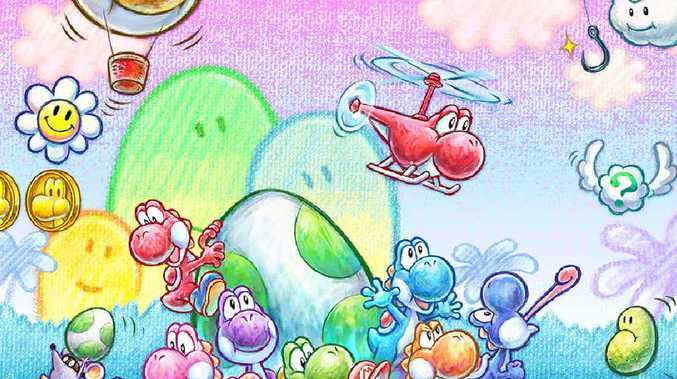 Indeed, Yoshi's New Island feels uncannily familiar to fans of the old game and, as such, the current release is a noteworthy effort. It is just that the new game doesn't take things forward in developing the series. This was something the original did with aplomb. Everything is as you'd expect it to be in Yoshi's New Island and, while that means the game is charming, competently designed and enjoyable to play, it lacks the wow factor of the original as there is not much apart from the visuals and new level designs that is really new about what you get. This is doubly ironic, considering the title, as "newness" or, more correctly, innovation is an element that is in short supply. Yoshi's New Island is arguably simpler than the original when it comes to level design. The game presents plenty of charming 2D platform levels but they lack the dynamic direction changes that were so much a part of the original. Instead, stages are usually a simple linear walk from one side of the land to the other, with less variation than Yoshi fans would come to expect. More is the pity. As a consequence you don't get those jaw-dropping moments where you are suddenly heading off in an unexpected and exciting direction, as things for the most part keep plodding inexorably from left to right. This doesn't mean New Island is dull. It isn't. The action is still colourful, the opponents are mixed and creative and progress is rewarding. It just isn't quite as amazing as those who played the original game would expect. Boss battles in the new game are also simpler and disappointingly less challenging. There are unique attack patterns for each boss but they are very predictable in most instances and defeating a boss feels very much like the same process, no matter which oversized foe you are facing. If this new release is the first Yoshi game you have played you will probably be impressed, as New Island is a quality platformer that delivers quality entertainment.